Resonate is a Twitter client for community activists, small business networkers, artists, bloggers, and platform-specific indie developers. If you need to connect with like-minded individuals or minor celebrities in your industry, then Resonate is for you. In contrast, Resonate can’t really help you to amass huge numbers of Twitter followers. Resonate was born out of my information overload from using Twitter. That is the low signal-to-noise ratio that often plagues a Twitter timeline. 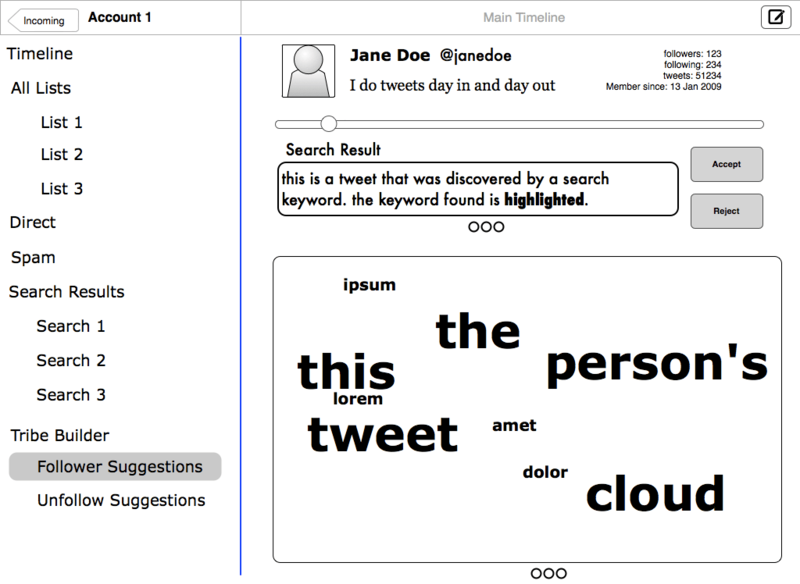 Resonate helps dampen the noise by aggregating tweets into word clouds so that you can quickly see what are the important happenings in your world. Word clouds enable organic, dynamic, hassle-free filtering without needing you to know what filter conditions to setup beforehand. 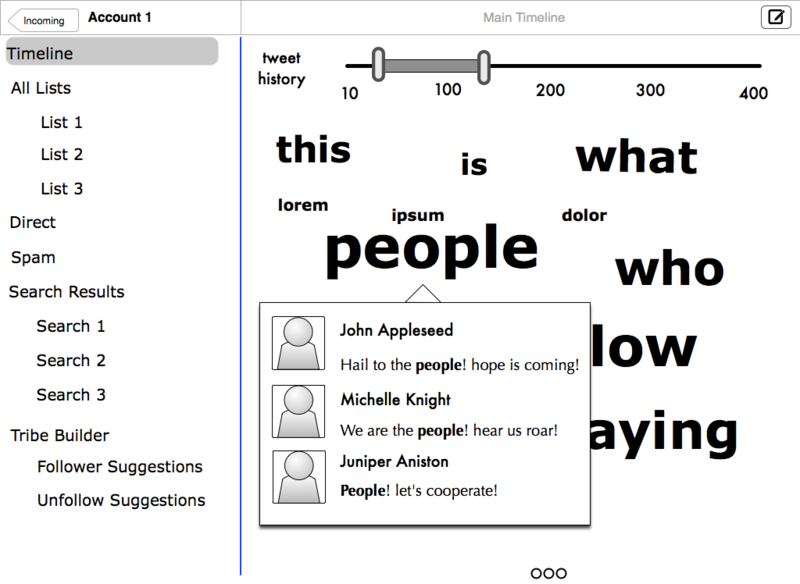 From a bird’s eye view of tweet clouds (pun intended), you can then dive in to join individual conversations with the people that you follow. This post shows very early mockups of Resonate’s screens. Please feel free to provide your input in the comment’s section at the bottom of this article. Better yet, join Resonate’s list and get notified when we launch. The first (or “home”) screen is dedicated for incoming messages. 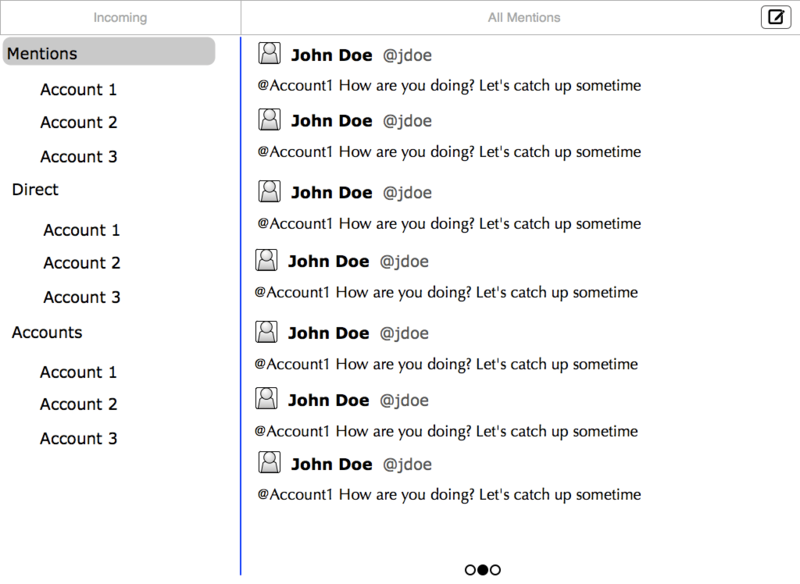 Your @ mentions and direct messages from all accounts are consolidated into a single view. This way you can quickly glance which tweets that are important and you can immediately jump in to those conversations. Composing tweets is easy – just tap on the compose button in the upper-right corner to compose a quick tweet. The compose button is always available and you can tweet from anywhere within the application. From the word cloud you can also swipe to get a more traditional list of reverse-time-ordered list of messages. This is useful if you are currently engaging in a heated discussion and would like to see up-to-the-minute messages. Tapping on an account in the home screen shows the account view. Here you can see more information related to individual accounts. You can see the account’s primary timeline, timelines from lists, direct messages, @ mentions, searches, and the tribe builder. As always, the timelines are displayed in a word cloud. 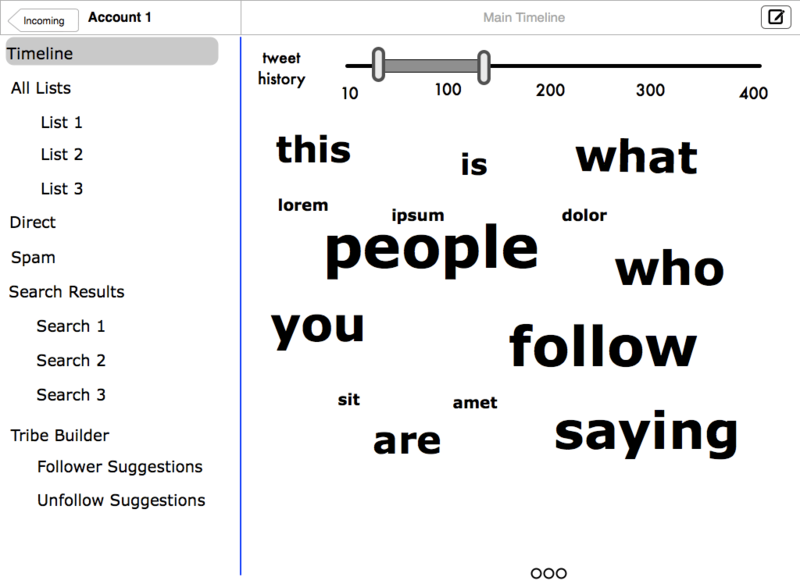 Tapping a word in a cloud shows the individual tweets which contains that word. 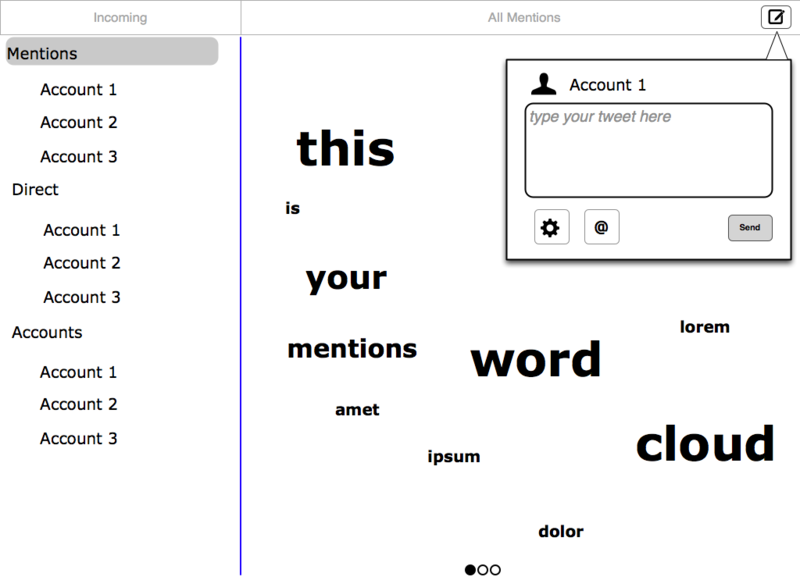 Here you can reply to the tweet to engage in a conversation with the person or even retweet to amplify his/her message. The tribe builder provides suggestions of who to follow and who to unfollow. The follower suggestion works by using your Twitter search results. For every match in the search result, the account will be added in the list of suggestions if you haven’t followed or add the account into one of your lists. The account’s recent tweets are shown in a word cloud form, so that you can see whether this account is interesting enough to follow. Tapping on accept button means that you want to follow this account. Whereas tapping on the reject button removes the account from the follower suggestion and will not suggest the same account again in the future. In addition, the tweet that match the search result is also shown for your review. What about unfollow criteria? Frankly I haven’t given much thought about it. Do you want to unfollow an account if it haven’t followed you back after a few days? What if you haven’t replied any of his/her tweets for a month, should you unfollow those? Tell us in the comments why do you unfollow an account and how do you “clean up” your followings. So that’s all I have for you at the moment. As you can see for yourself, we’re still in the very early stages of the design. Please let me know what you think of it in the comments. Better yet, register your e-mail address to get notified when we launch Resonate.